The third generation Camaro with t-tops is an iconic car, the wind in your hair, sun on your face! 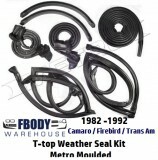 Fbodywarehouse will get you back in order with the t tops and the specific parts you need to make them look new again! 1982 - 1992 Camaro Trans Am T-Top Lock Set NEW!